The cruise ship tourists who visited historical municipalities of Limasawa, Southern Leyte and Capul, Northern Samar had their taste of the world-renowned Filipino hospitality and now know what was meant by the slogan “It's more fun in the Philippines”. The 87 tourists and their tour guides and escorts were mostly divers, naturalists, geologists and birdwatchers. They paid USD710 for their 21-day cruise in the Philippines. The 100-suite MS Caledonian Sky sailed from Sandakan, Malaysia last February 7 and its first stop was Palawan. Regional Director Karina Rosa Tiopes of the Department of Tourism welcomed the guests when MS Caledonian Sky made a stopover in Capul Island in Northern Samar on February 18 and on Limasawa Island in Southern Leyte on Feb. 23. Capul, one of the oldest municipalities in the country, is located along the stretch of San Bernardino Strait. It is an island-municipality rich in cultural heritage. Its 15,000 residents speak a unique language called Inabaknon. The people of Capul inherited the Inabaknon language from King Abak, a king from Java, Malaysia who set foot in Capul during the 13th century. Even during the galleon trade, it was spoken until now, even if nearby islands speak Cebuano and the Waray-Waray vernacular, according to Mayor Isidro Suan Bandal. While in Capul, the tourists were welcomed with dances and Filipino songs. They even dared ride the "habal-habal" (single motorcycle-for-hire where the driver takes on more than one passenger), the mode of transportation on the island. They were awed by the scenic view at the historical Faro de Capul (lighthouse) and learned the island's history from the local tour guides. A presentation of local dances and songs was offered to the tourists at the fortress church of St. Ignatius de Loyola, a national treasure. The 400-year-old stone church was declared a historical site by the National Heritage Commission of the Philippines in 2011 (NHCP). The highlight of their trip was a visit to a coconut farm, where the locals showed the tourists why they called the coconut tree the tree of life. One guest even climbed a coconut tree and rode on a "kanga", a buffalo-pulled sled usually made from bamboo and wood. They saw how copra was made – from harvesting to drying and transport. The next demonstration was crafting home products out of coconut parts – broomsticks, baskets, roof shingles, baskets and charcoal. Not a single part of a tree was wasted. “They go loco over coco,” Director Tiopes mused. Also, they saw how the delicacies using coconut milk and coco-meat were cooked. They even bought some delicacies to take home. Capul Mayor Isidro Suan Bandal said it was the first time that a cruise ship visited the island. The foreigners also had an off-shore excursion in Limasawa Island. They visited the Limasawa Shrine, learned to write their names in Babayin, an ancient way to write one’s name. They also tried henna tattooing of pintados design. Pintados was how the Spaniards called the natives when they conquered the country since Filipinos had their bodies laced with intricate designs embedded in the skin. They also watched the operatta of Rajah Kulambo and his five wives (that’s how the word Limasawa came from the lima (five) misua (wives) of Kulambo). An operatta is a shorter version of an opera, a story with singing and lots of talking lines. Rajah Kulambo was the chieftain when the first mass in the Philippines was held in Limasawa 494 years ago. The event in Limasawa was the biggest in the tourists' 21-day expedition. “It was like a town fiesta with native foods complete with lechon (roasted pig). Indeed, it was a culinary feast and the foreigners enjoyed to the hilt,” recalled Mayor Melchor Petracorta of Limasawa. Petracorta said with the forthcoming 5th centennial of the first mass in the Philippines on March 30, 2021, they were expecting more cruise tourists. He also noted they have a very rich marine life good for snorkeling and diving. The tourists also had whale shark interaction in the marine-rich Pintuyan and San Francisco, Southern Leyte and swam with the gentle giants. “Even the whale sharks were cooperating,” said Tiopes. The whale sharks showed up when the tourists were diving in the clear waters of Sogod Bay. 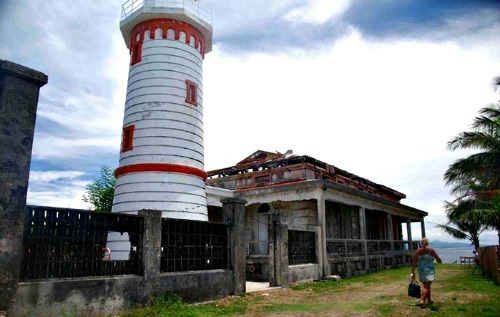 Last March 2014, Tourism Secretary Ramon Jimenez visited Eastern Visayas, to see how the department could help prop up the economy after the super typhoon Ruby (international name Haiyan) struck the region. Knowing how the region is richly endowed with nature, history and culture, he envisioned it to be the Cruise Tourism destination. On that trip, he brought with him several Manila-based cruise tour operators. Among them was Lourdes Banzon, president of the Sharp Travel Service (Phils), Inc. which is responsible for bringing cruise tourism to Region 8. They convinced Hapag-Lloyd to include Kalanggaman Island in Palompon in their cruise itineraries to the Philippines. (Europa1, europa2 and bremen).